Pumpkin isn't something you normally read about in blogland in December. I'm a little behind with my posts as my computer crashed. I was hoping that my husband would have been able to get things working as he's done so many times before. Sadly, everything is gone. He wants to break it down and sell the parts. I don't even want to think about that! Fortunately, we've got a new computer on the way and my photos were still stored on my camera's memory card so...whew...it's not a total loss! Speaking of my husband, he hasn't developed the taste for healthy food yet (he considers the lettuce and tomato you get in a cheeseburger to be adequate veggie intake for the day). 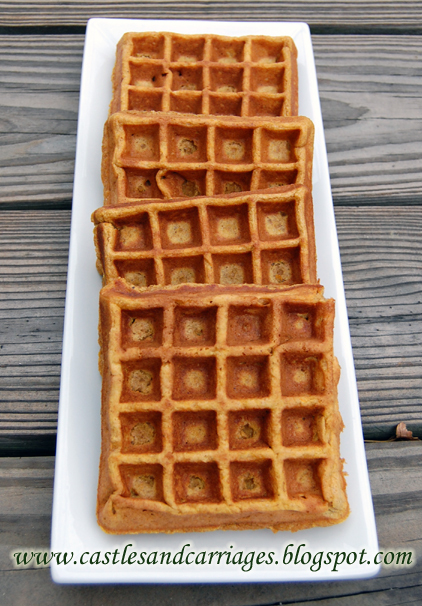 I've tried subbing whole wheat flour in other waffle recipes before but my husband would always say, "This tastes healthy." Which translates to "while this is edible -- I prefer not to eat these again." When he came home and smelled the pumpkin waffles cooking, he had to try one even though he had already eaten breakfast at work. His response? "These are good." These waffles have my husband's stamp of approval and I feel better feeding this to my family knowing that they're a little healthier than the usual waffle. 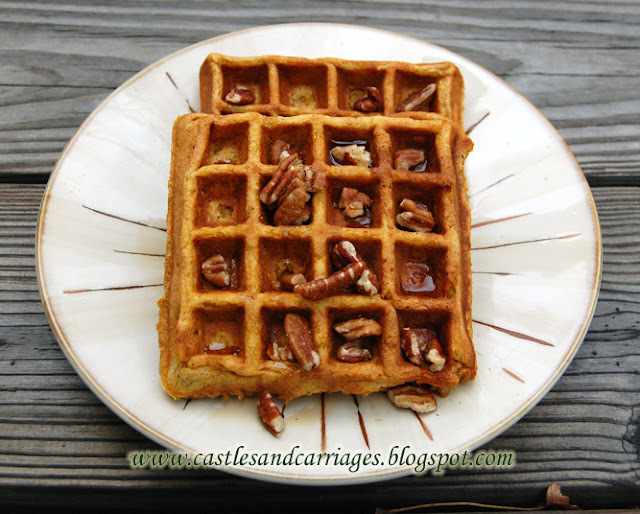 So, without further adieu, here is the recipe for the Pecan Pumpkin Spice Waffles. 1. Preheat a waffle iron according to manufacturer's instructions. Combine whole wheat flour, all-purpose flour, sugar, cinnamon, pumpkin pie spice, nutmeg, salt, and baking powder in a bowl. Set aside. 3. Ladle the batter onto the preheated waffle iron. Cook the waffles until golden and crisp, 5 to 7 minutes.